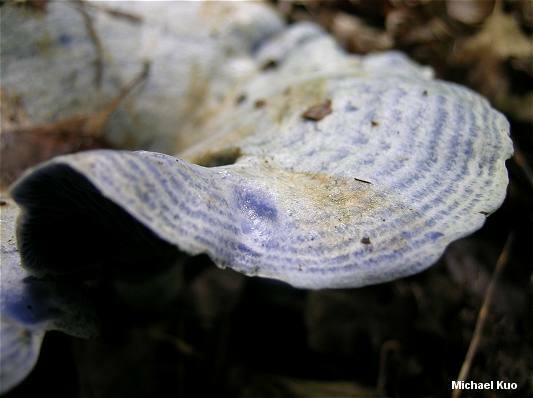 There is no mistaking Lactarius indigo. It is a truly beautiful, blue species that exudes dark blue milk when damaged with a knife point. Only Lactarius chelidonium and Lactarius paradoxus come close in appearance--and they only do so when very young, before they have begun to develop their brown and yellow shades (they also have yellowish and brown milk, respectively). 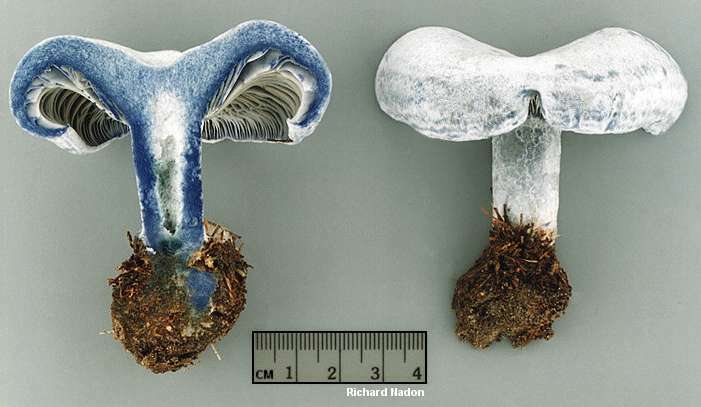 Hesler and Smith (1979) describe Lactarius indigo var. diminutivis, from Texas, as similar to var. indigo, but with a small cap (3-5 cm across), flesh that turns green within a few minutes of exposure, and a pure white spore print. 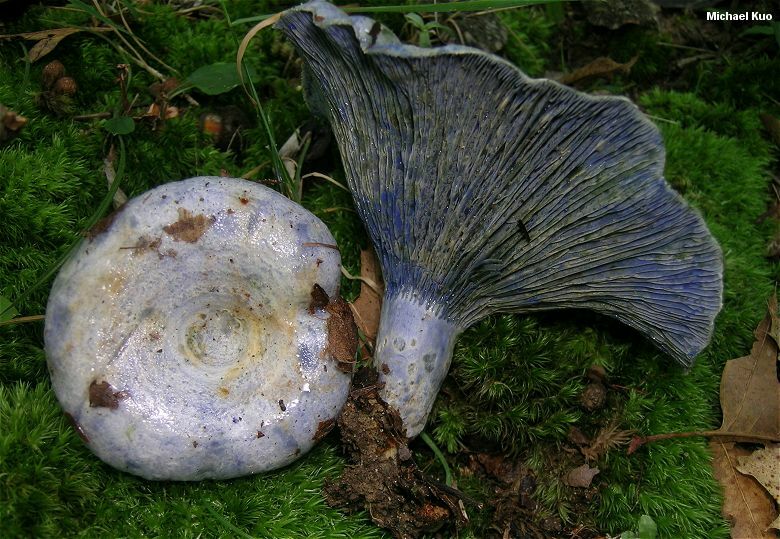 Nuytinck and collaborators (2006, 2007b) produced DNA results supporting the separation of Lactarius indigo from other members of section Deliciosi, but results were inconclusive regarding the status of var. diminutivus. 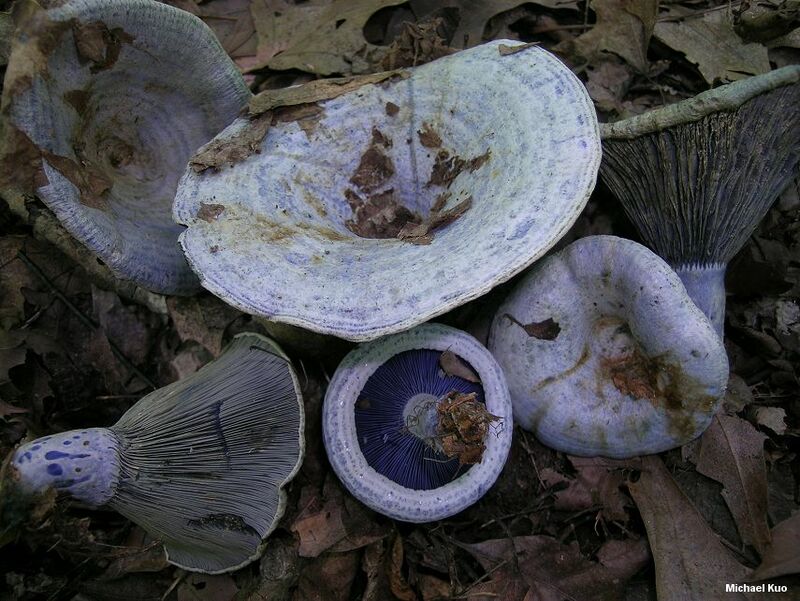 However, the researchers only included two Lactarius indigo specimens (one from West Virginia and one from Belize). 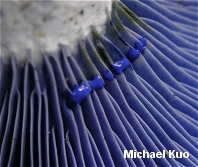 Since Lactarius indigo is found in so many diverse ecosystems--from oak-hickory forests to ponderosa pine zones in the southwestern United States to cloud forests in Mexico--and since it demonstrates considerable variability in its appearance, it would not surprise me if a detailed study discovered several distinct species within the current species concept. 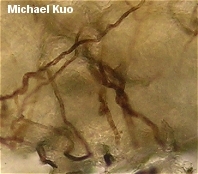 Ecology: Mycorrhizal with oaks and with pines; growing alone, scattered, or gregariously; summer and fall; fairly widely distributed in North America from the northeast to the southwestern United States, Texas, and Mexico--but apparently absent in the Pacific Northwest, on the West Coast, and in the northern Rocky Mountains. Cap: 5-15 cm; convex becoming flat or vase-shaped; the margin at first inrolled; deep to medium blue when fresh; grayish or silvery blue when faded; sometimes developing brownish areas when old; with concentric zones of color, or sometimes evenly colored; sticky or slimy when fresh; bruising and discoloring deep green, especially with age. Gills: Attached to the stem or beginning to run down it; close; colored like the cap or a little paler; becoming nearly yellowish at maturity; staining green. Stem: 2-8 cm long; 1-2.5 cm thick; equal or tapering to base; sometimes a little off-center; slimy at first but soon dry; hard; hollowing; usually with potholes on the surface. 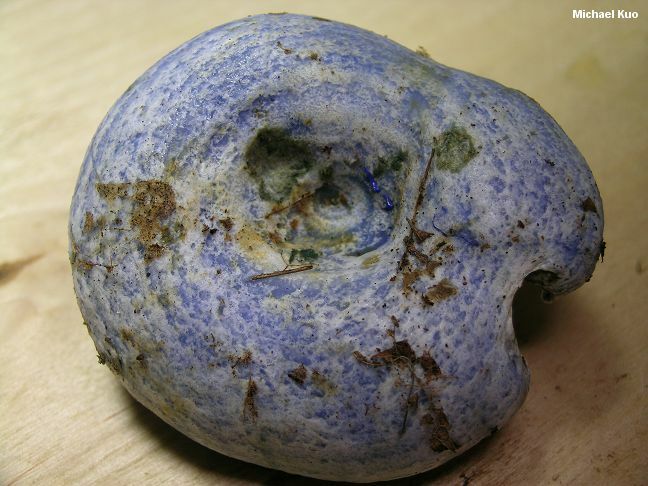 Flesh: Whitish, turning indigo blue when cut; staining slowly greenish. Milk: Deep indigo blue; becoming dark green on exposure. Odor and Taste: Odor not distinctive; taste mild to (sometimes) slowly, slightly acrid. 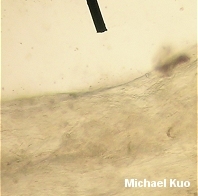 Chemical Reactions: KOH negative or yellowish on cap surface. 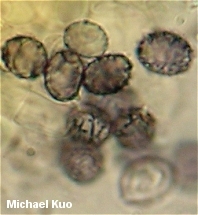 Microscopic Features: Spores 7-10 x 5.5-7.5 µ; broadly ellipsoid to subglobose; ornamentation about 0.5 µ high, as amyloid warts and connecting lines that sometimes form partial reticula. 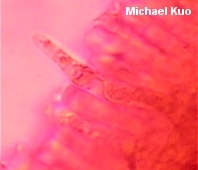 Pleuromacrocystidia cylindric-ventricose; inconspicuous; to about 60 x 8 µ. Cheilocystidia inconspicuous; clavate to subcylindric; to about 30 x 6 µ. Pileipellis an ixocutis. Lactiferous hyphae prominent; reddish brown to brown in KOH. REFERENCES: (Schweinitz, 1822) Fries, 1838. (Saccardo, 1887; Coker, 1918; Kauffman, 1918; Hesler & Smith, 1979; Smith, Smith & Weber, 1979; Weber & Smith, 1985; Arora, 1986; States, 1990; Phillips, 1991/2005; Lincoff, 1992; Metzler & Metzler, 1992; Horn, Kay & Abel, 1993; Montoya & Bandala, 1996; Barron, 1999; Roody, 2003; McNeil, 2006; Miller & Miller, 2006; Nuytinck et al., 2006; Kuo, 2007; Nuytinck et al., 2007b.) Herb. Kuo 07120001, 07220701, 08210902.